SEATTLE – Correlation of childhood vaccines and autism studied at the Washington National Primate Research Center (WaNPRC). Study shows no evidence of autism-like behavior or neuropathology in rhesus macaques after receiving typical childhood vaccinations. All animals in the study developed normally after being administered thimerosal-containing vaccines. 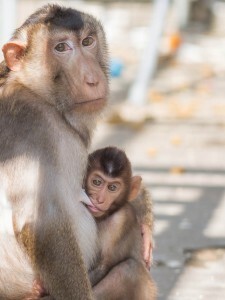 Infant Pigtail macaque (Macaca nemestrina) nurses from mother at Washington National Primate Research Center. The data indicate that administration of thimerosal-containing vaccines such as Hepatitis B and DTap, to rhesus macaques does not result in brain or behavior abnormalities like those observed in autism spectrum disorder. The study results are published in the journal Proceedings of the National Academy of Sciences. “It is of great importance to determine whether childhood vaccines that contain this preservative play a significant role in altering brain development, such as autism,” says lead investigator Laura Hewitson of The Johnson Center for Child Health and Development in Austin, Texas, and affiliate investigator with the WaNPRC. The study provides a comprehensive analysis of the influence of thimerosal-containing vaccines on the brain and behavior in a nonhuman primate model. Virtually no negative behaviors, such as rocking, self-clasping, and repetitive behaviors were reported, regardless of vaccination status. No cell or protein changes in the cerebellum, hippocampus or amygdala were found between vaccinated and unvaccinated animals in the study. The perceived safety of childhood vaccines has had a major impact on immunization rates – including the measles mumps and rubella (MMR) vaccine. Concerns emerged during the 1990s about thimerosal’s potential to harm children’s brain development. Thimerosal is a mercury-containing compound. For decades it was employed to keep vaccines free from contamination by germs and bacteria. In 2001, The Food and Drug Administration recommended that manufacturers remove thimerosal or reduce it to trace amounts in pediatric vaccines. It is still used as a preservative in flu and meningitis vaccines. The FDA determined that children receiving multiple thimerosal-containing vaccines at a young age were at risk for exceeding the Environmental Protection Agency’s safe exposure limits for methylmercury.